Baking with banana is always exciting.Mainly because the ripe,blackened bananas finally find their abode and the wonderful flavor that banana provides to a baked goodie is just too good.How about roasting the banana before adding to the cake batter and how about spicing it up with a few drops of Rum,now it sounds all the more exciting,doesn't it? I had bookmarked this recipe from Baking Bites ages ago and planned to bake it during Christmas.Of course,Xmas came and went but the cake never got baked.Why Xmas time,because that's when I get my annual stash of Rum in my teetotaler home!I got the biggest surprise while I was searching for Rum,guess what--a bottle full of dry fruits and nuts soaked in rum,I really cannot contain my excitement!! Only goof up with this cake happened when I poured the icing on top.I felt the rum icing was too thick and added a drop of milk.As soon as I poured the icing on top,it started curdling.My bad.It tastes awesome though,big consolation for the lack of pics of the whole cake! Preheat oven to 180C.Grease a 6 cup Bundt pan with butter and flour it. Cut the banana into one inch thick slices and roast in a non-stick frying pan till it starts browning.Mash well with the back of a spoon and keep aside. In a large bowl, cream together butter and sugar until light. Beat in the egg followed with vanilla extract, vegetable oil, mashed bananas and rum. In a medium bowl, whisk together the flour, baking powder, baking soda and salt. Add half of the flour mixture to the butter mix and stir to combine. Add in the buttermilk, followed by the remaining flour mixture. Bake for 35-40 minutes, or until a toothpick inserted into the center of the cake comes out clean and the top springs back when lightly pressed. Beat together butter, rum, milk, vanilla and about ½ cup icing sugar in a bowl until smooth. 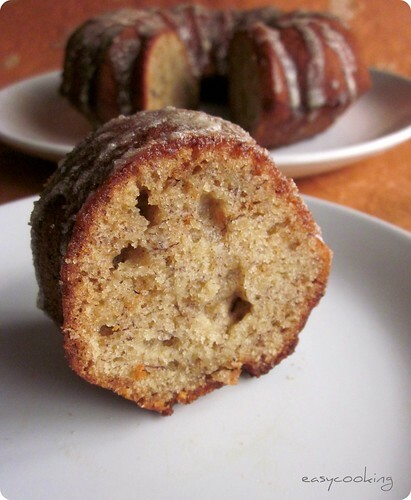 Gradually blend in additional sugar until you have a glaze that is smooth and thick enough to drizzle over the cake. Additional sugar will make a glaze suitable for a thicker drizzle (i.e. from a piping bag). I halved the original recipe but used the same amount of bananas hence used 1 egg in place of 2. I substituted buttermilk with yogurt and the texture of the cake was very light and fluffy,unlike the dense texture which is normally associated with cakes of this kind. Follow the recipe as is for the rum drizzle and it might not curdle.I added milk at the last stage and believe that's the reason for the curdling. Sending this to Sonia of Dinner Recipes from Sonia's Kitchen who is hosting Celebrate Sweets-Cakes this month,an event originally started by Nivedita. 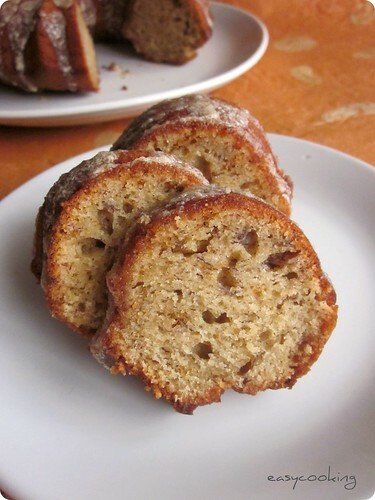 love banana cakes and this one sounds so awesome with the roasting part and the rum..
Wow Divya!! The name sounds so exotic and the pictures look even more mouthwatering -I am definitely book marking this recipe!! Gorgeous cake, looks super moist and incredible..
Rum Mmmmm.... the cake mst hv tasted nice, can we make it without eggs coz we dnt eat eggs at home. Just baked a banana cake as well..You are right the flavour is amazinggg..This looks fabulous with the roasting..A different approach. wow Divya, that looks awesome, absolutely drool-worthy !!! You are a bundt cake specialist! The cake looks light, wonderful for a banana bake. 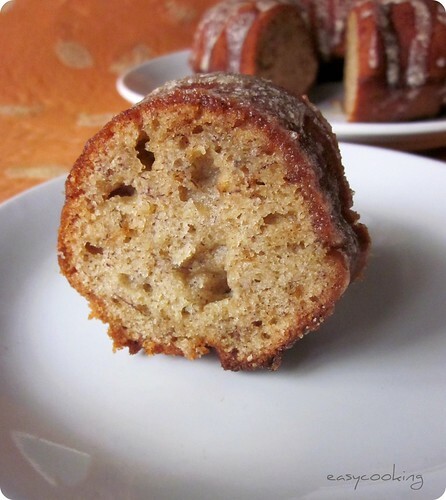 Banana rum cake looks absolutely delectable...Loved the recipe.. I love the baked banana small coming out of the oven. Roasting the bananas is new to me. The cake looks perfectly baked. Hi Divya.. I'm kinda new to baking so I was wondering if you could tell me the sort of oven you use? Is it a convection microwave oven or an OTG? Any advice for a beginner? This sounds so good and looks even better! excellent recipe :) i'm sure it tastes amazing! That cake looks delicious Divya. I'm always looking for ways to use blackened bananas too. The curdling confounds me. Can't understand why that would have happened! Hi Divya. I just baked this cake today and my frosting curdled too. I did not add any milk over and above what your recipe suggested and yet when I was beating the sugar with the liquids, it started getting a strange texture. I thought it would be okay once I pour it over the cake, but it curdled :-( did you happen to find out why it happened with yours?